Cook Knives for cafeterias and restaurant kitchens come in durable stainless steel for a rust proof life. These restaurant chef Knives are strong for busy commercial kitchens and are used for light chopping, heavy duty chopping, slicing, and cutting of meats, vegetables, and other foods. Buy your wholesale kitchen Knives at the restaurant supply superstore. We carry top manufacturers like Mundial, Forschner and Russell Harrington. Forschner Mini Chef Knife - 5 in. 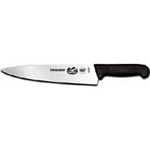 Forschner Chefs Choice Blade Knife - 10 in. 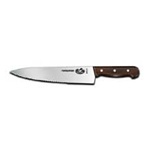 Forschner Fibrox Handle Chefs Choice Blade Knife - 10 in. 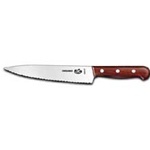 Forschner Rosewood Handle Chefs Choice Blade Knife - 12 in. 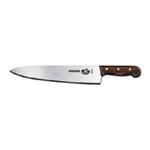 Forschner Rosewood Handle Chefs Choice Blade Knife - 8 in. Forschner Fibrox Handle Chefs Choice Blade Knife - 8 in. Forschner Rosewood Handle Chefs Choice Wavy Blade Knife - 10 in. 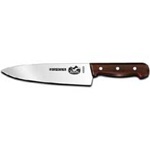 Forschner Rosewood Handle Chefs Choice Wavy Blade Knife - 7.5 in. Mundial Cooks Wide Knife White Handle - 10 in. Mundial Cooks Wide Knife White Handle - 8 in. Russell Cooks Knife - 10 in. Russell Chef Santoku Style Knife - 9 in. Russell Cooks Knife Black Handle - 10 in. Russell Cooks Knife 10 in. Russell Cooks Knife White Handle - 10 in. Russell Cooks Knife White Handle 10 in. Russell Wide Cooks Knife - 10 in. Russell Cooks Knife - 12 in. Russell Cooks Knife - 8 in. Russell Cooks Knife 8 in. Russell Scalloped Cooks Knife - 10 in. High Carbon Cooks Knife - 6 in. Buy your restaurant cooking staff the best Knives from the leader in restaurant supply smallwares and equipment. Our knives stay sharp longer than your ordinary home kitchen ones.